How native-like is a cold-denatured structure? A protein has several different levels of structure. The primary structure is the arrangements of atoms and bonds, and it is formed in the ribosome by the assembly of amino acids as directed by an RNA template. The secondary structure is the local topology, the helices and strands, and this forms mostly because of the release of energy through the formation of hydrogen bonds. The tertiary structure is the actual fold of the protein, the way helices, strands, and loops are arranged in space. The fold forms primarily because of the favorable entropy of burying the protein’s hydrophobic groups where water cannot access them, analogous to the formation of an oil droplet in water. This suggests that, in addition to the well-known phenomenon of proteins denaturing, or losing their higher-order structure, under conditions of high heat, proteins might also denature when they get too cold. Where ΔH is the change in enthalpy (i.e. the heat released or absorbed by a reaction), ΔS is the change in entropy, and T is the temperature of the system in Kelvin. Here, the change we are talking about is the transition from the folded state to some unfolded state. Simplistically, since the entropic contribution is scaled by the temperature, one can imagine that for a reaction with favorable entropy and unfavorable enthalpy, lowering the temperature could cause the reaction to reverse. Protein folding is only marginally favorable at biological temperatures, so one could easily imagine that lowering the temperature enough could cause a protein to prefer the unfolded state. Where Tr is some reference state at which the thermodynamic parameters have been determined, and ΔCp is defined with respect to the native (folded) state. Because the various states of the protein have different Cp (unfolded chains typically have higher Cp), at certain temperatures above and below the biological optimum we can expect proteins to lose their higher levels of structure. Even this is still an oversimplification, of course, because it does not directly account for changes in water structure and cosolute properties with temperature. These features may cause ΔCp itself to vary with temperature rather than remain constant. Unfortunately, for most proteins the temperature that favors unfolding lies below the freezing point of water, which makes this phenomenon difficult to study unless you do something unusual to your system. In 2004, Babu et al. (1) reported results from experiments that used reverse micelles to study the denaturation of ubiquitin at temperatures below freezing. By encapsulating a protein-water droplet in inverted micelles dissolved in pentane, it was possible to reduce the temperature to 243 K without causing freezing. 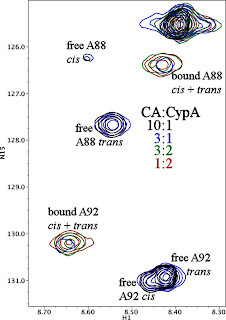 These micelles also had the convenient property of tumbling quickly in the pentane, which allowed for reasonable NMR spectra even at these low temperatures. 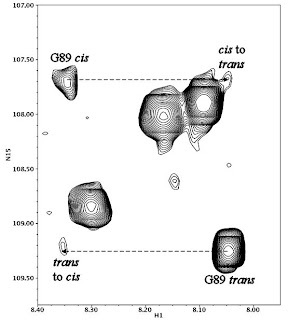 The appearance of the spectra they obtained indicated that the protein underwent a slow unfolding process with many different unfolded states, and also that the protein did not unfold in a cooperative fashion. Rather, it appeared that one contiguous region of the protein unfolded while the rest remained folded (the main helix was particularly stable). This wasn’t expected, because ubiquitin apparently unfolds in a completely two-state manner when overheated. This being the case, what’s expected is for the protein to either be all folded or all unfolded, not some mixture of the two. However, cold does not affect all intramolecular contacts the same way. Lowering the temperature is expected to make hydrophobic interactions less favorable while not significantly affecting polar interactions like hydrogen bonds. This being the case, one might expect an α-helix to persist through a cold-denaturation transition, as happens in this case. Something similar is observed in an upcoming paper in JACS from the Raleigh and Eliezer Labs (2), which approaches cold denaturation using a mutant form of the C-terminal domain of ribosomal protein L9. An isoleucine to alanine mutation at residue 98 of this domain doesn’t appear to significantly alter the structure, but it causes the protein to denature somewhere in the high teens. At 12 °C the unfolded state is about 80% of the visible population, and this is where Shan et al. performed their NMR experiments. They assigned the unfolded state using standard techniques and then decided to see what they could learn from the chemical shifts. As I’ve mentioned before, the chemical shift of a nucleus depends on the probability distribution of the surrounding electrons, and therefore is sensitive to the strength, composition, and angles of the atom’s chemical bonds. Because the dihedral angles of the protein backbone are a good proxy for the secondary structure, one can use the chemical shifts of particular atoms to determine whether a given residue is in a helix or strand. When they performed this analysis, Shan et al. noticed two major differences between the native and cold-denatured states of the protein. The first was that the helix and strand propensities of the denatured protein were much lower than the folded form, as expected. In addition, however, they noticed that one loop of the protein had gained α-helical character. That is, it seemed like an α-helix had actually gotten longer as a result of the unfolding. This doesn’t mean that denaturing the protein added secondary structure. The low values in the output from the algorithm Shan et al. used suggest that the secondary structure in this denatured state forms only transiently. 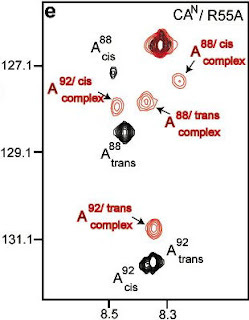 However, the chemical shifts suggest, and other structural data appear to confirm, that this region of the protein has an increased propensity to inhabit a helical structure as a consequence of the unfolding. These results emphasize the fact that the “unfolded state” isn’t as simple as it’s often described. Residual structure persists in unfolded states of many proteins, and unfolded ensembles of one protein generated through different means (heat, cold, pH, cosolutes) may not resemble each other. Unlike unfolding at high temperature, cold denaturation of ubiquitin appears to be non-cooperative. In both ubiquitin and L9, it appears that helices are robust to the unfolding process, persisting and even propagating as the protein denatures. While some of these features may be held in common between different kinds of denatured states, others may be unique to particular denaturation conditions. 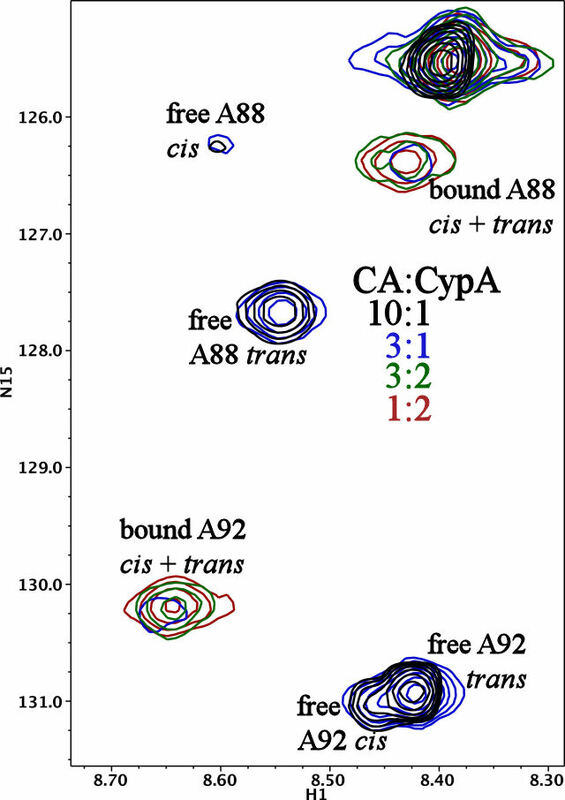 The lingering question is which of these unfolded ensembles best resembles the denatured state that exists under biological conditions, giving rise to misfolded states and their associated diseases. Spongiform encephalopathies are transmissible diseases that can have a major economic impact on agricultural exports, and pose a significant challenge for surveillance of the food supply. Scientists generally believe that these diseases are transmitted via a self-propagating, aberrant conformation of the prion protein (PrP). This prion hypothesis suggests that PrP alone should be sufficient to cause symptoms or death. If this hypothesis is true, then it should be possible to reproduce the disease using recombinant proteins expressed in yeast or bacteria. In tomorrow’s Science, researchers from Columbus and Shanghai report that they have managed to do this, establishing that PrP alone can account for prion disease transmission. Previously, other groups had successfully produced recombinant PrP (recPrP) and generated amyloid fibrils that appeared to contain the pathogenic conformation (PrPSc). When injected into mice, however, these amyloids had limited infectivity, which raised doubts as to whether these fibers are the cause of the disease. Wang et al. decided to take a different route, using a technique known as protein misfolding cyclic amplification (PMCA). In this approach, misfolded aggregates of a protein are broken up using sound waves and then incubated with normal, folded protein. If the misfolded protein can cause normal protein to adopt an aberrant conformation (as PrPSc can), then the misfolded protein will be amplified. By performing many cycles of this experiment, one can in principle produce a very large amount of PrPSc from a single misfolded chain. Wang et al. also added some ingredients to their reactions that they believed would promote prion formation: RNA and a lipid called POPG. Under these conditions, they detected a protease-resistant protein after 17 rounds of PMCA amplification. Under normal circumstances, PrP is cleaved by the protease, like a pair of scissors cutting a string. If PrP has aggregated, however, it becomes much more difficult to cut, as if you were using safety scissors to cut a thick hemp rope. 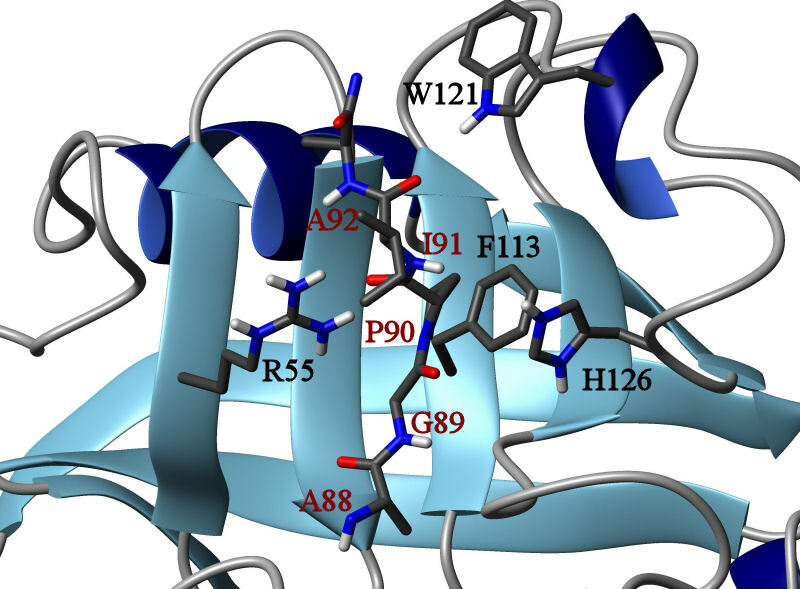 The researchers discovered that the protein from this reaction (which they called rPrP-res) could cause normal protein to also become protease resistant. And, when they treated protein from mouse brains with rPrP-res, they found that it, too, formed protease-resistant aggregates. To really put the hypothesis to the test, however, tests in live animals were needed. The researchers injected one group of animals with the product of a PMCA seeded with rPrP-res. They also injected three additional groups of animals with control cocktails to prove that neither the non-protein ingredients, nor the unprocessed protein, caused the disease. None of the control animals developed symptoms of encephalopathy during the experience, but all of the mice injected with the PMCA product died in about five months, while displaying clinical signs of prion disease. Their brains were inspected post-mortem using histological and molecular means. The brains clearly showed the formation of the vacuoles that give spongiform encephalopathy its name. Additionally, protease-resistant PrP was detected in homogenates of the brain tissue, indicating that the rPrP-res had propagated in the living mouse brains, causing disease and eventual death. When these homogenates were injected into the brains of other healthy mice, a similar pattern of pathology recurred. This proved that the effects of rPrP-res could be serially propagated, just as prion disease is. These results leave little room for doubt that misfolded PrP is sufficient to cause prion disease; no other infectious agent was required. The effectiveness of RNA and POPG in promoting the pathogenic conformation may indicate that these or similar molecules play a role in the spontaneous development of prion disease. Aside from adding to our knowledge directly, this research has the potential to significantly increase our ability to investigate prion disease. The ability to produce bona fide infective prion molecules in vitro from recombinant protein opens up new avenues for experiments in structural biology and biochemistry that may enable us to cure or entirely prevent these diseases, rather than just trying to contain them.